Last week the city announced flawed school integration goals. A better approach? Move the median. The plan, released June 6, calls for incremental steps toward racial and socioeconomic integration over five years. You can read it in full here. For months, Mayor Bill de Blasio and his schools’ chancellor Carmen Fariña have promised a comprehensive plan to address the segregation that has plagued the city school system for decades. Last week, the plan finally arrived in the form of a 12-page document that contains not a single reference to “segregation” or “integration." The diversity plan is the policy equivalent of a last-minute gift delivered sans wrapping paper or card. The question now among integration advocates: Can we exchange it? Critics have called the plan “small-bore,” “meek,” and "unlikely to make a dent.” But the plan’s modest ambition isn’t the only problem. The city’s metrics and terminology also represent a troubling lack of seriousness toward the issue. In five years, the city aims to increase by 50,000 the number of students who attend “racially representative” schools, which it defines as schools with student populations greater than 50 percent but not more than 90 percent black and Hispanic. The mayor claims the target will “make a very big difference in terms of diversification” for “tens of thousands of kids.” Even some critics have conceded that it is a positive first step. But a close inspection of the goal reveals how it would likely have no significant effect on racial diversity and could be achieved even if the school system becomes more segregated. Let me explain. Overall, 67.8 percent of public school students are black or Hispanic. Strangely, the city rounds this figure up to 70 percent, explaining how it set the bookends of the "racially representative" range (plus or minus 20 percentage points from the rounded mean), but not why. In a system of more than 1.1 million students, 2.2 percentage points is significant. In any event, only about 30 percent of students attend schools inside the 50-90 percent black-and-Hispanic range. An additional 50,000 students would boost that to 35 percent, hardly a major shift. But to really make sense of the goal, it’s important to know that the current distribution of black and Hispanic students skews dramatically toward the upper extreme. This is most evident when looking at the percentage of black and Hispanic students in each of the city’s 1,856 public schools. The distribution looks like a hockey stick, with the great mass of schools having an extremely high percentage of black and Hispanic enrollments. In more precise terms, half of the public schools (928) have black and Hispanic enrollments of at least 90.1 percent — the median. A quarter (464) are at least 95.9 percent black and Hispanic. Because so many schools are clustered just north of the “racially representative” zone, the slightest demographic nudge — in some cases, the addition of a single white or Asian kid — could drop a cusp school into the zone, thus contributing its entire enrollment toward the 50,000-student goal. 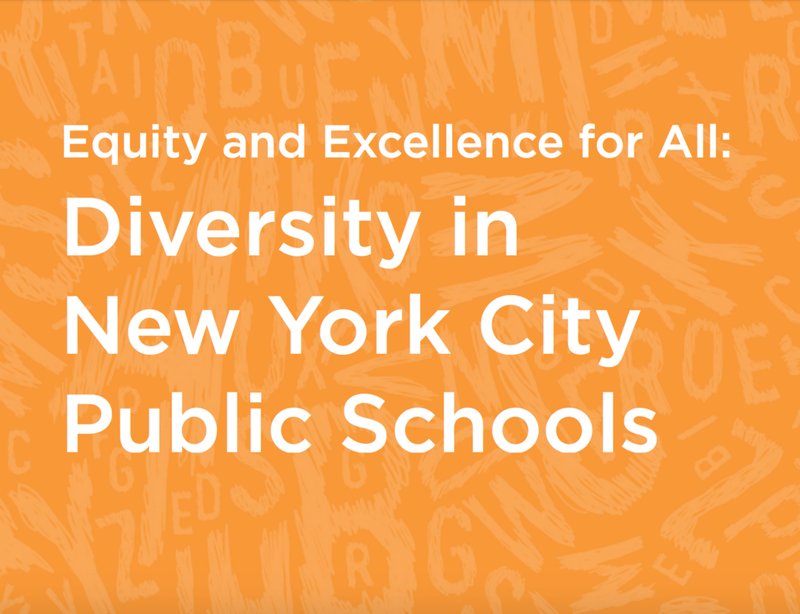 If the 105 schools currently between 90.1 percent and 92 percent black and Hispanic fell to 90 percent (moving an average of just one percentage point), the city’s goal would be reached. Let’s say it happens. What would this allow us to claim? Well, for the 50,000 students who move inside the zone, the demographic shift of their schools would likely be imperceptible. More importantly, it would tell us nothing about the racial diversity experienced by the 65 percent of students still outside of the zone. As a small percentage of schools inch closer to the mean, the poles could drift even farther apart. In other words, the city could reach its goal even if the system at large were to become more segregated. To illustrate this concept, imagine Lebron James’ goal next season is to score within five points of his points-per-game average more often — say, three more times than he did this season. He could achieve his goal while having an even more scattered overall scoring distribution. Measuring the point totals that fall within an arbitrary zone provides no information about point totals outside of the zone. Now, before proposing a better metric, I must first comment on the term “racially representative,” which is inaccurate and misleading. Most of the schools in the city’s “racially representative” zone have at least two races that are heavily underrepresented or overrepresented. P.S. 28 in Queens is 89.9 percent Hispanic but meets the definition because it has zero black students. P.S. 398 in Crown Heights meets it, too, even though it has just two white and four Asian students (13 percent of the school identifies as “other”). Why would the city choose such a flawed term? My guess is that they thought “racially representative” would evoke thoughts of diversity, as opposed to segregation, a word the mayor hesitates to use in reference to schools. But, no matter how they label it, what they are really assessing is the degree to which black and Hispanic students are racially isolated — which is exactly what school segregation researchers measure. So, how to fix the goal? Focus on moving the median. As I mentioned, the median percentage of black and Hispanic students in city schools is 90.1 percent. Anything done to move the median toward the mean (67.8 percent) would result in a less segregated system overall. Setting targets related to the distance between the mean and the median would also control for possible demographic shifts that static goals, such as the current one, do not take into account. As you can see, the distribution is skewed heavily toward the upper end of the range. Moving the median toward the mean would result in a more normal distribution (i.e. the system would become less segregated). “Moving the median” could also be applied to socioeconomic and academic segregation, which are just as severe and harmful as racial segregation. While choosing appropriate metrics is important, so too is language. The city should be more transparent about its mission, which, beneath the veneer of “diversity,” appears to be (and should be for now) reducing the stark segregation of black and Hispanic students. To its credit, the diversity plan established a School Diversity Advisory Group that will, over the next year, "evaluate initial goals and policies" put forth in the report. We should be prepared to push that group to adopt more ambitious goals with sound metrics, and then hold the city accountable for meeting them. For, as anyone with public policy experience knows, the true work comes after a policy has been made. Sign up to receive the latest news and updates from The Bell. We promise not to flood your inbox. Thank you for signing up! Please tell your friends about The Bell.